When you need a lift in warehousing, building maintenance, event set-up or another indoor application, you need an electric scissor lift; it is always the right choice for indoor tasks. However, our electric scissor lift range also includes configurations that are suitable for construction sites, mining, shipping and other heavy duty, outdoor jobs. Force’s Electric Scissor lift range can reach heights of up to 12.2m, handle loads of 800kg and even comes in 4×4 models ideal for getting around on building sites. With low noise levels and no emissions these are perfect for all your indoor at height requirements. 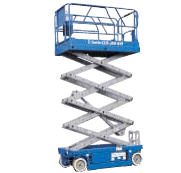 Features such as automatic self-leveling for surface gradients, extra wide work platforms, and the slim easy access design also make the electric scissor lift a great outdoor option also. Review the detailed specifications and diagrams for each model by clicking on the links below. We also have scissor lift tables that let you compare models by size, height, capacity and other useful metrics. Choose any product from our electric scissor lift range for hire or for purchase. All of our Scissor Lifts are available for hire across Australia. The wide range allows you to meet the requirements of any vertical access task.